Based in Boca Raton, Florida, MobileHelp serves clients in all 50 states. A leading provider of M-PERS (Mobile-Personal Emergency Response System) technology, MobileHelp has been in the business of medical monitoring services for the past decade. MobileHelp offers four different medical alert systems: Cellular Duo, Cellular Classic, Cellular Smart, and the new Solo system. The Cellular DUO protects anyone home and away from home, also using cellular service through AT&T and GPS satellite tracking technology. The Cellular Classic System is great for those who just need protection at home; utilizing the AT&T cellular network, this system works independent of a landline. The Cellular Smart is a GPS-enabled watch that is also great for being away from home. The Solo is a mobile system as well that provides emergency medical response at home and on-the-go at a lower price than Cellular DUO, but has fewer features. MobileHelp offers low monthly monitoring fees, ($19.95/mo), no equipment fees, no activation fees, no long-term contracts, and a lifetime warranty on all equipment. Read MobileHelp reviews below to see what customers have to say about the medical alert provider. The vast majority of MobileHelp reviews are overwhelmingly positive, highlighting great customer service, quality equipment, quick response times, and overall company reliability. MobileHelp complaints are limited, demonstrating a trustworthy company and a satisfied customer base. This can provide peace of mind to potential MobileHelp customers that want to make sure they are getting the best possible service from a top-rated medical alert company. MobileHelp offers a 30-day money-back guarantee for all customers, regardless of the plan or equipment purchased. This ensures a risk-free experience and can give customers peace of mind that they have a trial period to decide if MobileHelp is the medical alert provider for them. MobileHelp has a referral program that awards you a $200 Visa gift card for every referral you send their way. All you have to do is tell your friend to mention your name when he/she calls to order a medical alert device through MobileHelp. For additional verification, MobileHelp suggests calling them yourself as well to ensure you get full credit for the referral. Once your referral has been a customer for 60 days or more, MobileHelp will mail you a $200 Visa gift card. This is a generous offering and if added to your monthly monitoring fees, could give you free service for up to 10 months. The referral money is additionally convenient because you can choose whether or not you want to put the money towards your MobileHelp bill or if you would prefer to spend the money on something else. Most medical alert companies give you credit towards your account rather than give you money you can spend any way you'd like. 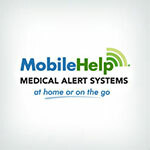 MobileHelp offers four simplified, but versatile medical alert systems. Duo: This doubles as an in-home medical alert system and a mobile alert system. Includes a base unit. Classic: This in-home medical alert system is ideal for those who stay at home but want the security of a medical alert system. Includes a base station. Smart: This Samsung-powered smartwatch is GPS-enabled, easy to set up, and stylish. It can also monitor your heart rate, calories you've burned, and steps you've walked. Solo: This mobile alert system can be taken anywhere since the mobile device is small enough to fit in your pocket. Each medical alert device is equipped with an emergency button that connects you to emergency responders at a certified monitoring center and has two-way communication as an added precaution. MobileHelp's focus is on GPS tracking technology. The company's Anywhere Help Button is their prized feature. Compared to some other companies in the personal emergency response niche, the Anywhere Help Button doesn't require a landline phone and can be used when taking walks, in the car, shopping, or on vacation. These alert systems will not only know who you are but where you are as well. With this button, customers can contact help from anywhere. In the time that a cell phone 911 operator spends gathering personal information, a MobileHelp operator will have contacted the closest emergency responders and will have already explained this information to them. Help will be on the way to the customer's current location already knowing the information they need to assist them. Once help is secured, MobileHelp's operators contact the customer's family, friends, and other loved ones. One feature MobileHelp offers is MobileHelp Connect® - a suite of online tools to help customers and authorized caregivers, such as family members, actively participate in monitoring the subscriber's health and well-being. MobileHelp Connect standard features are available at no extra charge and premium features are offered for an additional monthly fee. MobileHelp's mobile GPS medical alert systems offer location services that can be accessed through MobileHelp Connect. Anyone with access to their Connect account can log in and lock in on the GPS device to locate their loved one. MobileHelp Connect also offers system alerts that will notify you when the equipment has a low battery, is being tested or has been activated in an emergency. Features available will vary depending on the type of system and accessories used. Within MobileHelp Connect, there are two additional features that can be purchased for just $5 more per month: Medication Reminders and Activity Tracker. The Medication Reminder lets users (or a family member) schedule medication reminders online using the Connect portal and schedule friendly reminders to the user to take their meds every day and on time. These audio reminders come through the Cellular Base Station (included with the Classic and DUO systems). Activity Tracking allows a user to track their daily, weekly or monthly activity levels to ensure they are keeping an active lifestyle. This feature keeps family members aware of their loved one's condition as they live independently. Information is graphed through the MobileHelp Connect portal to help the user (or a family member) track trends to ensure a healthy lifestyle. It is also a great feature for families of people with dementia or Alzheimer's who tend to wander off. This information is taken through their Fall Detection Pendant and is kept within the Cellular Base Station (included with the Classic and DUO systems). MobileHelp has just released a new service called "MobileHelp Connect Premium" which provides a lifetime price guarantee, protection from replacing lost or damaged equipment, and additional discounts on added services and accessories. MobileHelp now offers a product called "Fall Detection Button". The Fall Detection Button is an important feature that automatically sends out an alarm if you fall and are unable to press your help button. Fall buttons have been shown to reduce injuries and deaths since there are times when seniors fall and cannot manually summon help. The Fall Button is also compatible with both the in-home and away units to ensure safety precautions no matter where you are. MobileHelp's monthly monitoring cost is $19.99 with no equipment or activation fees, an extremely competitive rate with added perks compared to other medical alert companies. There is also a lifetime warranty on all equipment, and you do not have to sign a contract to use MobileHelp's medical alert services. This is on par with other top-rated medical alert companies and ensures an affordable option for consumers looking for quality and reliable medical alert services. MobileHelp only works for those who live in areas covered by the AT&T network. Their monitoring system works with a cellular network to deliver 3G service that works both at home and while away from the home. Unfortunately, if AT&T doesn't service a specific location, MobileHelp won't work well there. The AT&T cellular network provides coverage to 97% of the continental United States, however, you should find out if the service is available in your area before purchasing MobileHelp's medical alert service. One fine print issue concerns the Mobile Help Connect feature. MobileHelp Connect is free, but there is an additional cost of $5 per 30 additional location requests. The free feature only covers up to 30 location requests per month. This only becomes an issue if the person using the medical alert device is traveling a lot and family members have to check in on them constantly; if they are, pricing can add up. MobileHelp is a reliable medical alert company with quality customer service, equipment, and overall medical alert services, giving MobileHelp a high star rating and an extremely satisfied customer base. There's no phone landline required to use the MobileHelp medical alert system. They are one of the leading providers of M-PERS or Mobile Personal Emergency Response System technology, servicing all 50 US states, so potential customers will have peace of mind knowing that a MobileHelp alert device is available everywhere. MobileHelp also offers MobileHelp Connect which is a platform that helps families track their senior loved ones while using their MobileHelp system. MobileHelp has an affordable monthly cost ($19.95), and the company does not charge an activation or equipment fee. The medical alert provider does not require customers to sign any long-term contracts, and there is a lifetime warranty on all equipment. There is also a 30-day money-back guarantee, so MobileHelp is completely risk-free. You can also refer a friend for a $200 visa gift card. Read MobileHelp reviews below to hear about MobileHelp experiences from actual customers. Call our recommended rep over at MobileHelp below. Or you can visit MobileHelp website. they are quick to send help. Emergency professional were very competent. I'm afraid that I'm going to accidentally make it go off. I've done that one time since I've had it. I've tested it and I wear it when I'm in the shower or when I'm outside working on my flowers. I didn't expect my payment to be so high. I had great help with MobileHelp. Every time I called, I never had a problem. I've had great customer service. They've always been very courteous and very helpful. At the beginning it was a little sensitive and we had a lot of false alarms but we've since learned how to stop it. They've always answered my questions quickly and accurately. The pendant could be improved. It tends to report falls when there are no falls and you can't really cancel it and they call the emergency without a lot of button pushing and talking to people. When I was setting it up at the very beginning they treated me well. I like it because my friend speaks spanish and english and the company has bilingual or multi lingual operators. It takes too long to get an operator to come on the line. I don't like it. I tested it and the device works good. The people have been very helpful and answered the things we had questions about. We paid over 600 dollasrds for the two of us to have it and we never use it because it sends out false alarms too easy. I was in the shower one day and I did not realize that I had pressed the button and I was shocked to find that my living room was filled with EMT's and I was not dressed, I had just gotten out of the shower. It was very annoying. It's very convenient to use. I just put the unit in for recharging and then when I get ready to go out, I just put it all on. It's been very convenient. I have the pendant around my neck and it is very sensitive and I have hit that sucker like three times by mistake and the response has been really really quick. I like their response time. I did test it and it went well. A couple of times, my wristband went off by accident when I was in the grocery story banging something adn all the sudden I heard a medical aleaert and I had to call them and say that it was a false alarm. They were right on the spot. When I tested it, I had a hard time at the beginning but then after that it was fine. It's new and I haven't had it that long, but the cost of MobileHelp is cheaper than what I was paying for a previous medical alert device. I used it accidentally. It's extremely sensitive and you may set it off when you do not intend to do so. I think it has great potential, but the sensitivity needs to be adjustable. I like that the device doesn't require a phone line and I like the little lights on the buttons. It's good for people to see the buttons. They've taken good care of me. The device works well. I tested it to make sure it's working and I don't have any problems with it. It's too sensitive. I can't even really wear it. It's difficult to pin the help button to the wall, it doesn't have the right adhesive to the back. The button also needs to be attached to a string or something, it's not secure enough. The representative Eric explained the process and everything went very well. If you bump it, it goes off. You have to punch to it stop. My mom did a test and they always call me promptly to find out what the problem is and if I need assistance. MobileHelp is so good to me. When I needed to use it, it was good but the paramedics didn't really do anything when I needed it. The customer service has been excellent every time I call. The customer service has a quick response. I've only tested it accidentally and pushed the button and I got a response right away. They've been really good. They answer my questions promptly. MobileHelp seems to be a good company. The device is easy to use. I like this necklace I got. I never could get a wrist band that worked. The wristbands were always too small. I used it a couple of weeks ago. I fell and I pushed the button and they had somebody here within just minutes of the time I fell. I touched it once and we got a response right away. It seemed like the phone started ringing even before it stopped beeping. They were very helpful. It's been wonderful with the very little experience that I've had. Every time I move, the alarm goes off and then I have to tell them that everything's alright. They've always helped me out with my questions. The only thing I don't like is the wristband. The band itself is uncomfortable. They are just fantastic. The device is very good quality. I tested it and everything worked great. I think MobileHelp is a very good company. The customer service rep was very friendly and very helpful when we were looking at ordering it. I like the options available for the different types of devices and I like the reaction time that they provide when there is an emergency. My aunt was outside and the fall detection device went off and she forgot to take the remote with her so the ambulance showed up in a very short period of time because they could not reach my aunt on the intercom system. They contact me and ask me how I like it and if it's working right now and if there's anything that they can do to make it better. Every time I needed them, they are right there. Well I like it because its affordable and I carry it with me. The thing goes off more often than it should. It's super sensitive. I haven't had to test it because it had gone off when I was at the other end of the state and they called to make sure I was alright. Everything comes on time and it comes in good shape. I tested it accidentally and we got a very quick response. People spoke to me before they sent anyone out. The necklace is very sensitive. I've had a number of false alarms caused by just flopping around on my chest. The one time I tested it, it worked just fine. They are very responsive when you call them and ask for help. The only thing I don't like is that the cord on the neck is long and it's a little bit difficult to get it shortened. It's gone off a couple of times and they've called quickly and helped us get through it. I don't like that it goes off and says 'fall detected' in the middle of the night but I know that it's for my own protection even if I am asleep in the bed, it thinks it's detected a fall. When I did fall, in my kitchen, there was no call put out to the EMS people. I had to push the button on my necklace to get them called. It didn't automatically detect my fall, but when I pushed the button, it called them right away. It goes off and doesn't take that much to activate it. It went off when I bumped it or something and it send a signal and they call me. I've gotten a couple that I didn't get the message and they came to my house. It doesn't hardly take anything to activate it. I had to call them with a couple of questions and they are personable and very dreamily helpful and it just seemed like they were able to answer anything I asked and quickly. It's easy to use and discreet. The testing was super simple. They sent the guide with the device and it's like step one, two, three, and you're done. I have had a couple times when I accidentally pushed the button and they were understanding. It says incoming call three times and they are right away answering the phone. They are very knowledgeable. It's very handy and easy to operate. We haven't had any problems with the customer service, it's been great. They've been nothing but wonderful. It's my mom's device and she loves it and it works perfectly. My mom accidentallyed tripped and it called them and it worked out great beacuse the people are so wonderful to her. We've found all the technicians and everybody has been very nice and easy to deal with. We've used the pendant, the watch isn't big enough. We tested with the technicians when we first got it and the one didn't work so we had to send that back and they sent us a new one and the same thing, they forgot to put the lock box in the package but got that now too so they were very efficient about getting it to us. One time it went off by mistake but you just reset it. It was very easy to do that. They always take care of what they say they're going to take care of. I tested the MobileHelp device this morning and it works fine. The device is easier to get used to than some of the other devices I've tried. I have the watch one that I use the most. It was set off by my job jumping on my arm, but I was really surprised they responded that soon, even though it was a mistake. You really don't need that much pressure to activate it if you really needed it. The staff is very knowledgeable. It's light weight, inconspicuous when I wear it, it's easy to use and it works. One night I went to bed and I was very sound asleep and apparently I accidentally pushed the button and the next thing I knew, there were first responders in my living room. The device works perfectly, every step of the way. There have been several times where it mistakenly went off when I bumped it accidentally and they were very prompt in response. I've tested it and it doesn't take long for me to get to them. It's pretty quick when you press the button. The alert device is easy to use and the testing was fine. The device worked as described.